Gazprom boosted its production in 2017 with more than 470bn m³ produced, 12% more than in 2016. In absolute terms, it is an increase of over 50bn m³ on 2016, leading to a theoretical spare production capacity of 90bn m³. 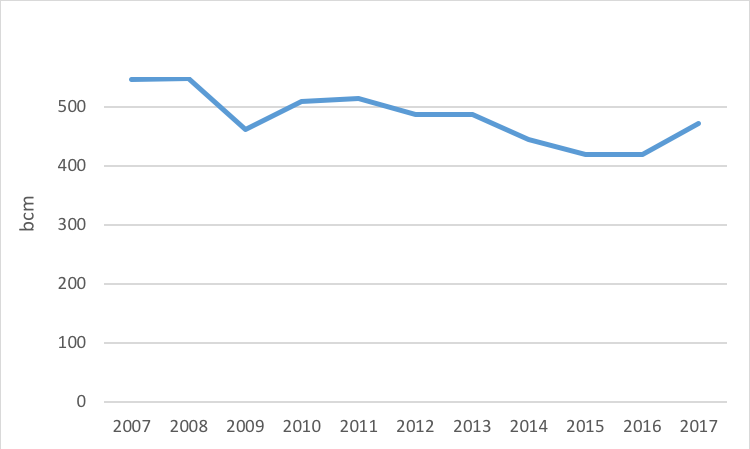 But this production level is still 13.9% below its record level of 2008. 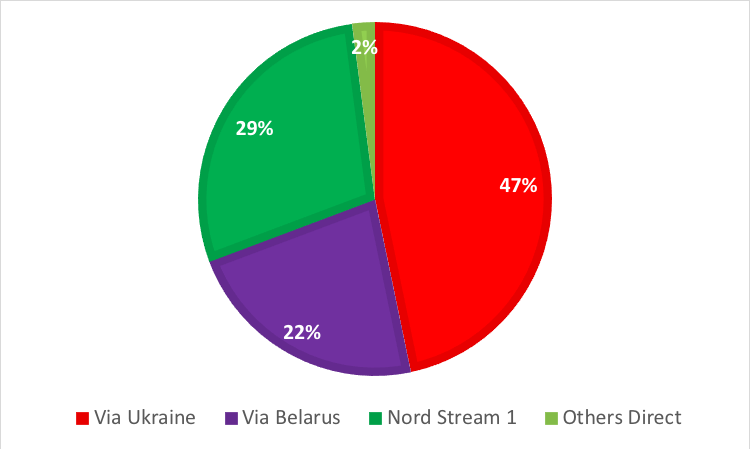 In 2017, Nord Stream delivered 51bn m³ (Russian or 47bn m³ under EU standards) of gas to Germany, accounting for 29% of the total Russian pipe gas received in EU. Gazprom has rightly chosen the direct link Nord Stream 1 over any other routes and should continue doing so. Hence with the lifting of the ban on utilising full capacity on Opal, Gazprom should, in 2018, prefer to use Nord Stream 1 at close to full capacity all year . So, we could have another 8bn m³ rerouted from Ukraine to Nord Stream 1. 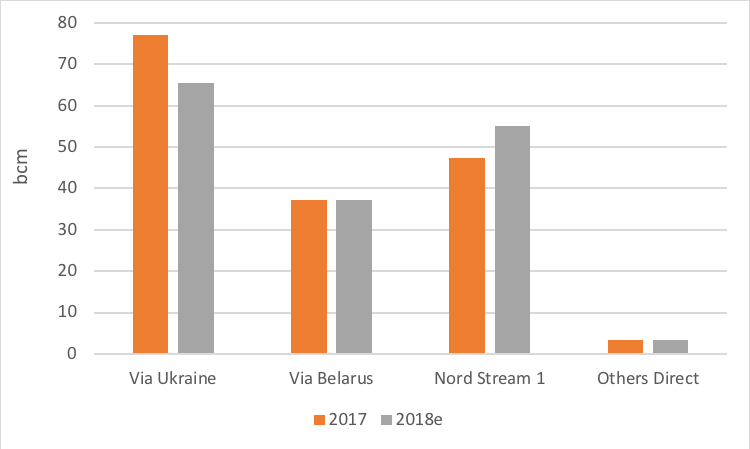 With at least 33bn m³ of actual spare transportation capacity to the EU via Ukraine and Belarus and expected reduced cap in Groningen production, Gazprom can further increase its EU market share in 2018, if it so wants. But that offer might not be welcome at the European Commission. Estonia (0.1bn m³ consumption in 2016) and Latvia (1.3bn m³ consumption in 2016) were not reported in Gazprom’s Exports European sales in 2016, Gazprom’s REMIT data started only in July 2016 and some gas exported could have been put in storage instead of sold. 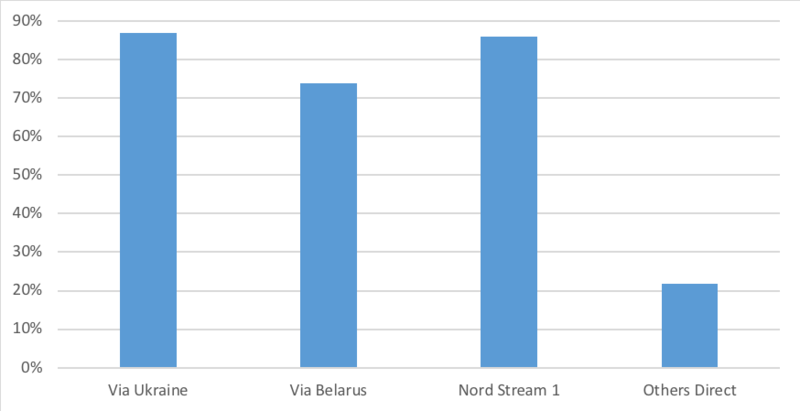 We believe Nord Stream 1 actual capacity is 55bn m³/y (EU standards – 59bn m³/y Russian standards).